Etiology: Congenital glaucoma caused by an autosomal recessive defect with incomplete penetrance. There is an absence or underdevelopment of the outflow channels with incomplete cleavage of the iridocorneal angles. 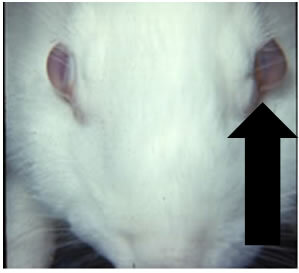 Incidence: The incidence of bupthalmia is moderate, and most commonly occurs in New Zealand White rabbits . Clinical Signs: Clinical signs may occur as early as 2 to 3 weeks of age, but are more common at 3 to 4 months of age. Signs include slight cloudiness progressing to increasing cloudiness of the cornea, a prominent eyeball (arrow), conjunctivitis, keratitis, ulceration, and rupture of the cornea. The condition may be unilateral or bilateral. Diagnosis: Diagnosis is made by performing a physical examination. 2. The Laboratory Rabbit, Guinea Pig, Hamster, And Other Rodents. 1 ed2012, 225 Wyman Street, Waltham, MA 02451: Elsevier.